With all the rain we have been getting, the flies have been horrible! My poor cows are constantly covered, making milking (even with a machine) quite the chore. I have found several homemade recipes that claim to work for a short period of time. I really would like to find something that works for the day instead of temporarily. After several test runs, I found a mix that I LOVE! I sprayed it on my fly infested animals and 3 hours later they are still fly free where I sprayed. I neglected the legs, don't neglect the legs. Here is is, my organic fly spray. As a bonus it doesn't smell to bad. This makes a small amount. Next time I make it I will triple or quadruple it. It has to be Lavender Mint dish detergent. Both oils repel flies. I am able to find it at Walmart or online. Don't shake, gently swirl around to mix. Mist the animal with the spray. Wherever you mist flies will stay away. I am going to try this. We have a couple of cows, and they always seem to be covered with flies. The trick will be getting up close enough to spray it on them. This will be my featured post on the HomeAcre hop tomorrow. can this be used on a calf 3 weeks old? Since this is made from all natural, safe ingredients you could definitely use this on a calf. It would also be safe for the Cow as she licks her calf. The only thing to remember is tea tree oil can irritate skin if it's too strong. It's diluted more than enough in this recipe however, to not cause issue. 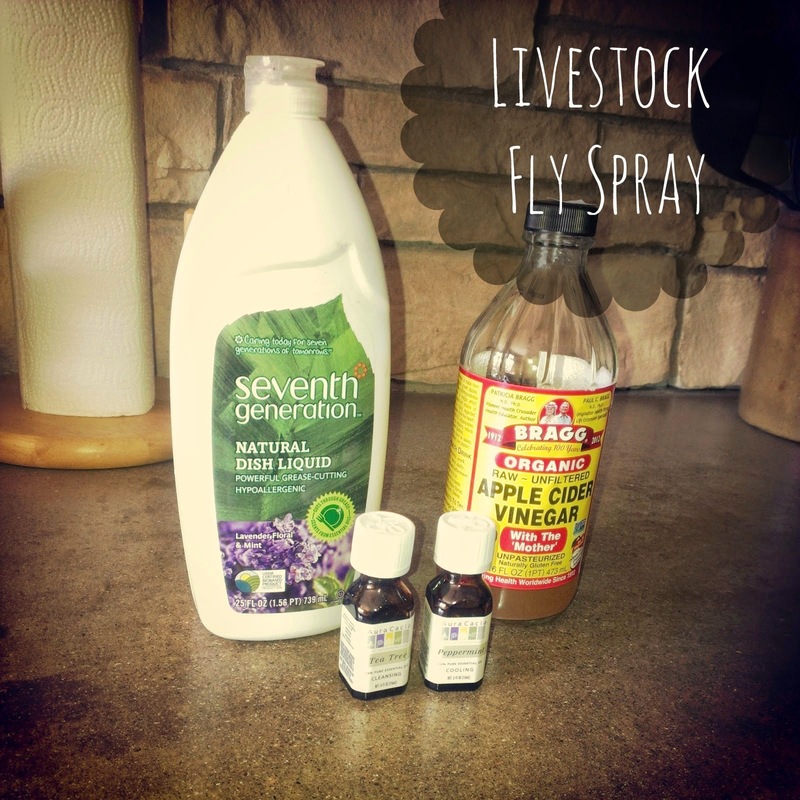 Im going to try this tomorrow on my horse the flies are bad horseflies,deer flies you name it. Im hoping that it would help with that too. My poor horses leg are bleeding from them and im using Bronco.. Question when you spray them with this how long does it work for I mean is this an everyday use like you do for the other ones? I used it every time I milk. Once in the morning and then in the evening. Although, I could have skipped the evening. We don't really have horseflies or deer flies, so I can't comment on how it will work with them. I have heard of people using listerine. Do you think the apple cider vinegar works better than listerine? I try to stay at natural as possible unless my animals well being is at risk. Also, being as self-sufficient as possible, apple cider vinegar is something that I can make myself.